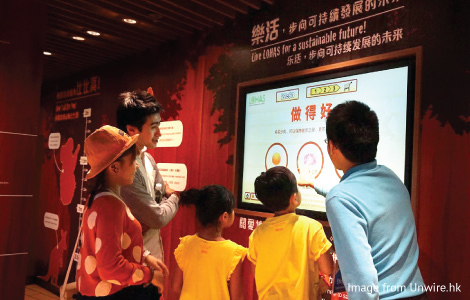 Through interacting with the games on a 55” touch-screen TV, the players can learn various everyday tips and tricks and will be inspired to contribute to the sustainable future of the planet by adopting LOHAS. To introduce the importance and simplicity in practicing LOHAS lifestyle, the interactive games are designed to have players play individually or as a team to learn about the tips in practicing LOHAS lifestyle in their daily life. To fulfil the operational needs of the Park, the game is designed to target both adults and families with kids. Players can choose to take on the challenges on their own or form a two-member team. 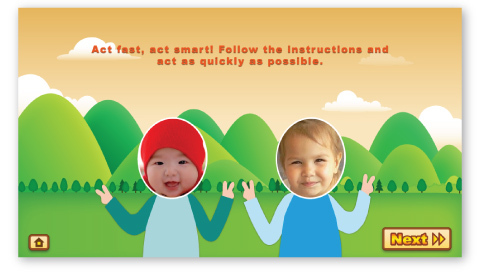 Parents can teach their kids how to preserve our environment while having fun playing the game. The game operates on a computer connected with a webcam and a 55” touch-screen TV mounted on the exhibition wall in the Attraction. Before challenges begin, the game instructs the players to take a photo of themselves with the webcam. The game then automatically superimposes player’s face on the game character. This adds a personal touch to the game and better engages the players to pay attention to the game messages. Save more water in the bathroom. Players make the decisions in each situation as the game character by interacting with the touch-screen TV. By the end of each challenge, players can learn some simple and easy tips in practising LOHAS in their daily life. After the game finishes, all players are awarded a personalised certificate with their picture added on. Players only have to input their name, then they can obtain the certificate real-time through scanning a QR code with their mobile phone. The players can save the certificate to their phone and share it on the social network to show others their achievement. 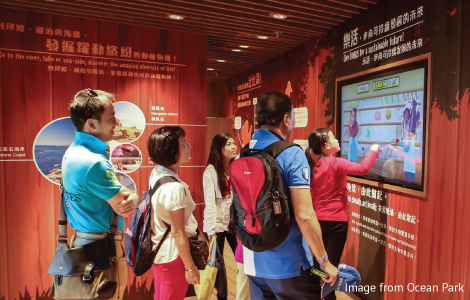 Ocean Park focuses on bringing educational and entertaining experience to visitors, our games are based on real-life situations which are fun to learn and play with. Messages are incorporated into 3 daily-life scenarios so that players can understand how they easily can practise LOHAS. Players’ engagement is enhanced as they can download their personalised certificate via scanning a QR code and share on social networks. 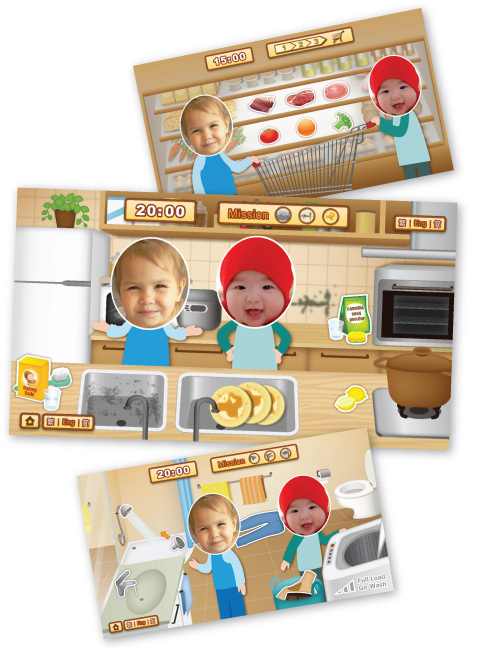 Player’s face are mapped onto the game character to make the games more engaging and personal. Cooperative game play makes players to discuss and interact with each other while making decisions in the game. This helps players better recall the LOHAS tips. 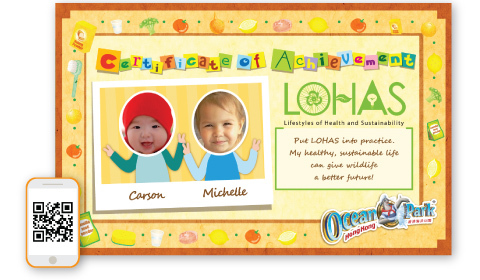 After being awarded a certificate, players will get a sense of achievement which encourages them practice LOHAS in their daily life.